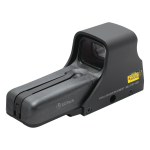 EOTech 512.A65 Sight » Protective Solutions, Inc.
Model 512 is EOTech's most popular holographic weapon sight. Ideal for when you need the best in speed and versatility, without night vision compatibility. Includes rugged aluminum hood assembly and knobbed mounting bolt (no tools required).